For interviews, or to find out about our services, please contact Bruce Anderson at banderson@abacusdata.ca (613-882-0929) or CEO David Coletto at david@abacusdata.ca (613-232-2806). In many markets these days, generational differences in outlook and priorities are important. 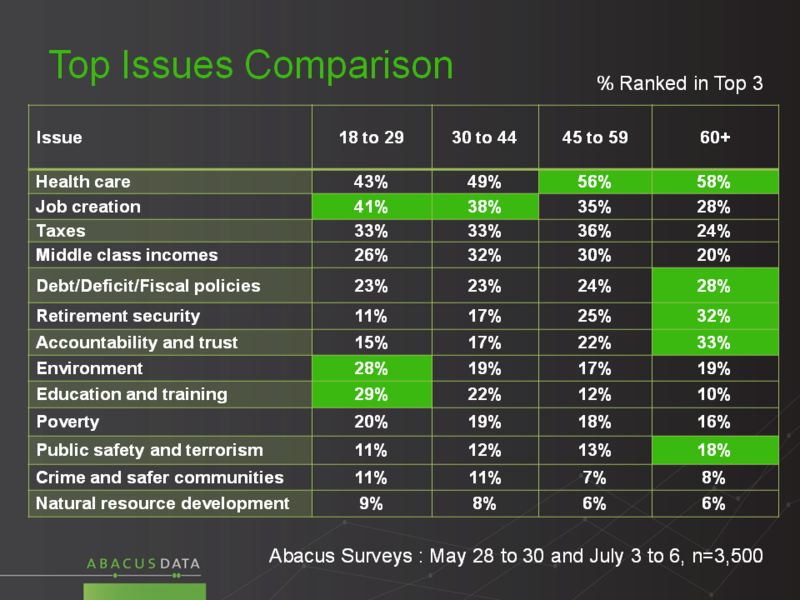 Over the coming months, as part of Abacus’ market leading work in understanding the role of generation in decision-making, we will highlight how four age groups compare (18 to 29, 30 to 44, 45 to 59, and 60+). In this release, we will focus on the perspective of Millennials (aged 18 to 29) towards the upcoming election and the parties contesting it. 1. They are no more or less happy than older people with the direction of the country. 45% say country is going in the right direction, 27% wrong track. 2. In the 2011 Election, 15% of this segment say they voted Conservative, 12%, NDP and 9% Liberal. Half chose not to vote or were ineligible to. Today, the NDP (34%) is ahead of the Liberals (26%), and the Conservatives (23%). The Greens do better among Millennials than any other segment. This is the weakest age group for the Conservative Party. 3. Millenials are the most “up for grabs” voters today. 84% of Millenials indicate that their vote is not firmly decided, which is 12 points above the average for the country. Half of Millennials say they have only a slight leaning or don’t really know which party they will vote for yet - 13 points above average. 4. A total of 84% say it is would be good to change governments, which is higher than any other age group. While a good proportion of those don’t feel all that strongly about it, as of now, only 16% think it best if the Conservatives are returned. Among those aged 60+, that number is 40%. 5. Millennials are more likely than any age group to say they will vote for the party that best represents their values and interests rather than the leader that would do the best job. 6. Millennials are not much different from other voters in terms of how they see the health of the Canadian economy. If anything, they show a bit more confidence and optimism. 7. When it comes to the issues they care about, Millennials tend to be less preoccupied than older voters with accountability, the deficit, retirement incomes, and health care. They are more interested in jobs, education and the environment. 8. All major parties can win sizeable proportions of the Millennial vote. They are no less likely than others to consider voting CPC: 44% compared to the national average which is 45%. 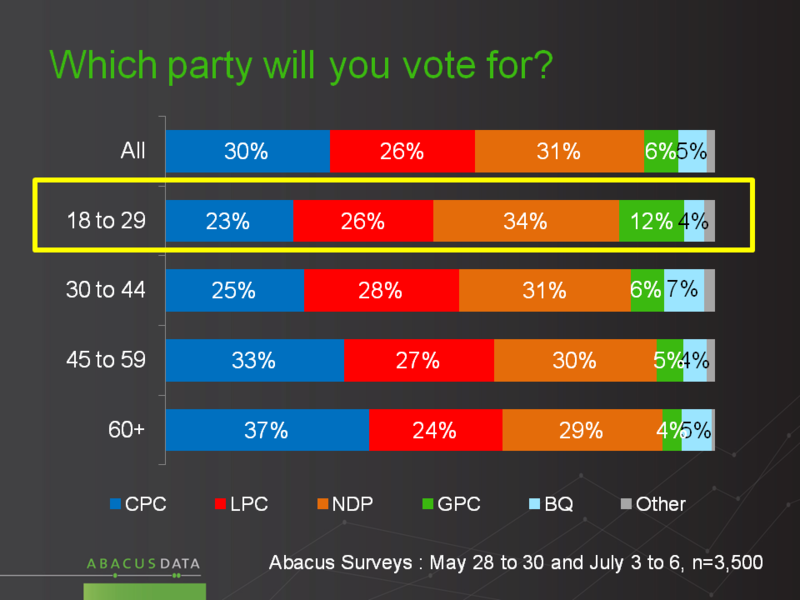 But they are more open to voting for the LPC (61%, 8 points above the national average) the NDP 66% (6 points above the national average) and the Green Party (44%, 13 points above average). One in five Millennials say they would consider all parties, which is 8 points higher than the national average. In summary, Millennials are pro-change and more open to progressive parties, compared to older voters. At the same time, their views towards the incumbents are not particularly hostile, and they feel relatively good about the economy and the direction of the country. In terms of the agenda that is most interesting to Millennials, there is a marked difference from older age groups, reflecting different lifecycle priorities. They also indicate a greater inclination to vote their interests rather than choose a leader for Canada. Winning enthusiastic support from this segment of voters will require a clear and compelling focus on the issues and values that matter most to them, including education, jobs and the environment. The surveys cited n this report were conducted at the end of May and in early July. Our survey was conducted online with 1,500 Canadians aged 18 and over from May 28 to May 31, 2015. A random sample of panelists was invited to complete the survey from a large representative panel of Canadians, recruited and managed by Research Now, one of the world’s leading provider of online research samples. The Marketing Research and Intelligence Association policy limits statements about margins of sampling error for most online surveys. The margin of error for a comparable probability-based random sample of the same size is +/- 2.6%, 19 times out of 20. The data were weighted according to census data to ensure that the sample matched Canada's population according to age, gender, educational attainment, and region. Totals may not add up to 100 due to rounding.